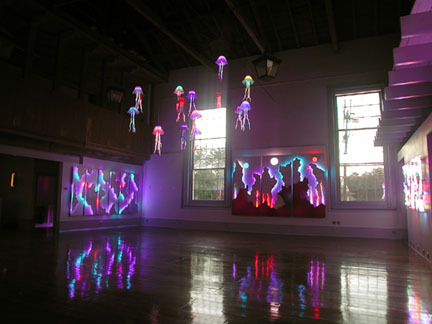 The Venusian Gardens Art Gallery occupies the second floor of the main building. The art gallery is divided into two separate but adjoining spaces: a large Venusian Garden art installation and a more formally composed exhibition space. The Venusian Garden art installation is a large work-in-progress that is conceptually based on the formal Japanese Rock Garden but thematically based on Ehlenberger's vision of a fantasy Venusian World. 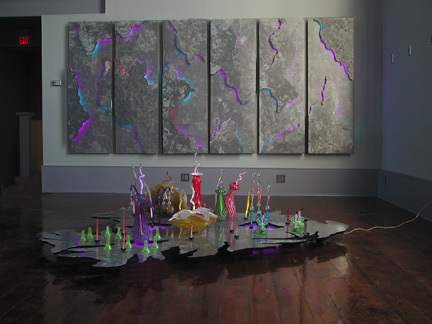 The installation is currently in its infancy yet still offers a unique vision with the promise of exciting growth and development. The formal exhibition space displays art and sculpture that may or may not be related to the theme of the Venusian Garden art installation. Currently displayed in this space are sculptures that span a decade of Ehlenberger's work but include some of his most recent work as well. Also on exhibit here are examples of his new "neo-Antique" series of wall sconces.